No one likes to accrue debt, and the cost of monthly interest payments can add a heavy financial burden, but a large percentage of Americans are unable to pay off their cards on a monthly basis. As part of the POPSUGAR Insights 2017 Personal Finance Report, we surveyed nearly 2,000 women between the ages of 18 and 44 to ask them how they manage their finances and think about their financial future. 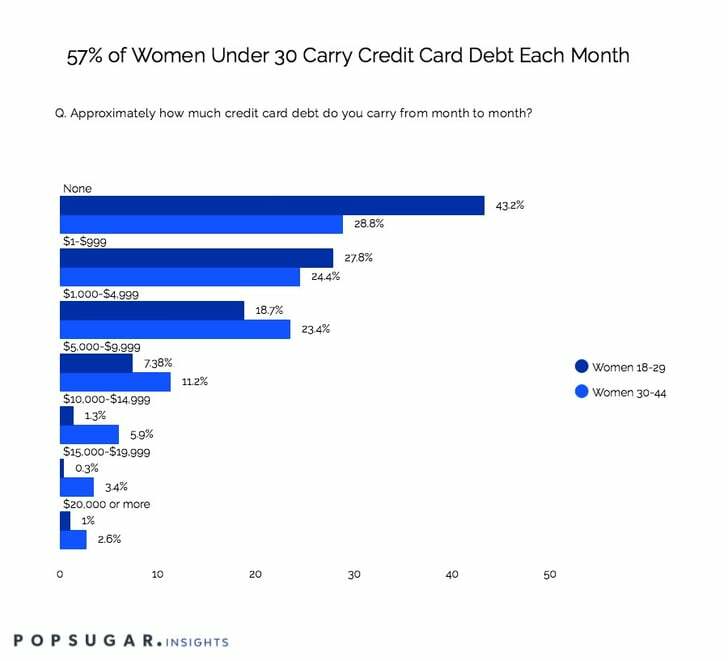 Overall, nearly 57% of women under 30 and 71% of women between the ages of 30 and 44 carry a credit card balance from month to month. Women between the ages of 30 and 44 are also more likely to have more debt in excess of $1,000 per month, as opposed to women under age 30% who are more likely to carry debt between $1 to $999. For marketers, the focus should be on offering content that educates women on how to manage their finances in both the short and the long term to ensure future success. Another approach would be to focus on creating content that offers stress management lifestyle tips to help women not focus on the downsides on managing debt, but rather come up with constructive ways to find life balance that incorporates a healthy view of personal finance management.